Where do the feeds come from? The feed is compiled of: Groota's pre-processed emails, and emails from your Gmail account (if applicable). Groota offers pre-processed emails and promotional feeds from popular brands so you can follow or un-follow a brand without signing up for their newsletters. If you are generally interested in a brand but would like to follow it a bit more before making the first purchase, Groota feeds would be ideal for you. After you link a Gmail account (optional), the feeds will come from your Gmail account. Here is an example: when you sign up with Groota and follow Nordstrom, the email feeds are from Groota. After you link a Gmail account, and you have used that Gmail account to subscribe to Nordstrom, the feeds will come from Gmail. Without linking your Gmail account, the feed will be generic, but when you link your Gmail, you will see your personalized specials and promos. All brands from your Gmail can be followed or un-followed anytime. I didn't see the option to link my Gmail. This function is only available for registered users. Register an account with us and verify your email, and you will be able to link your Gmail account from Settings view. What happened with the newsletters from my Gmail when I un-follow them? We will hide them from your feeds, and we don't delete them. All the newsletters under Gmail Promotions tab are processed by Groota, then moved to a folder called "Groota". When you follow newsletters of a brand, we show them in the Feed view, otherwise we hide them from the Feed view. When I start to follow a brand, I only see a few emails from the past few days. When you started to follow a brand, we allow you to scroll back to emails up to 14 days old. Is it safe to share newsletters to others? When you share a newsletter, whether it's from Groota's ready-to-follow brands or brands from your Gmail, you are sharing 'sanitized' version of the newsletter. Our process striped out email address (if any) and disabled some links. It is a better way to share: better than clicking on "view web version" at top of the email (because most of the "web version" still contains your personal email address). Even with the process in place, we still recommend that you share newsletters from your Gmail with people you trust. It is harmless to share newsletters from Groota's ready-to-follow brands because those newsletters don't have your personal data. I cannot find the brand I am interested in. I see a brand under "Uncategorized" category, and now I cannot find that brand anymore. When we bring in new brands, we try our best to choose at least one category for it. However, some brands take longer to identify the categories. For those brands, we temporarily put them under Uncategorized. If you don't see that brand under uncategorized anymore, it's likely it has been moved to a proper category. Use the search bar in the Explore view to quickly search for that brand. When you start following a brand, we show earlier feeds up to 14 days old, and the future emails from the brand. We only cache brand emails up to 90 days. We figure no one cares about news or promotions few weeks old. All saved feeds will not be removed from your Saved view. If you truely love a feed, make sure you save it by clicking on the heart icon. When I link my Gmail account, will you get my password? No. Gmail will not give us your password. Once you initiate linking Gmail, Gmail will ask you to login to Gmail first (so Gmail knows it's you), and then gives us a token to call Gmail APIs to pull emails. In short, Gmail sits between you and Groota. Everything we do needs to go through Gmail with the token. We also use the token to move emails from Promotions tab to a folder called "Groota". You can un-link Gmail anytime. I have emails of a certain brand in my Gmail account, but I don't see their feeds in Groota app. We only process the emails sorted into Gmail's Promotions tab. If the emails from that brand are sorted into your Primary tab, Groota won't process them. To view the emails from that brand in Groota app, please drag one email from the brand into Promotions tab. Gmail will remember your settings, and put future emails from that brand into Promotions. I just link my Gmail account, but I didn't see the emails from my Gmail account. When you link a Gmail account, we start to process emails from the previous 2 days and will continue processing future emails. The first process will take some time to show in your feed so they may not be visible right away. 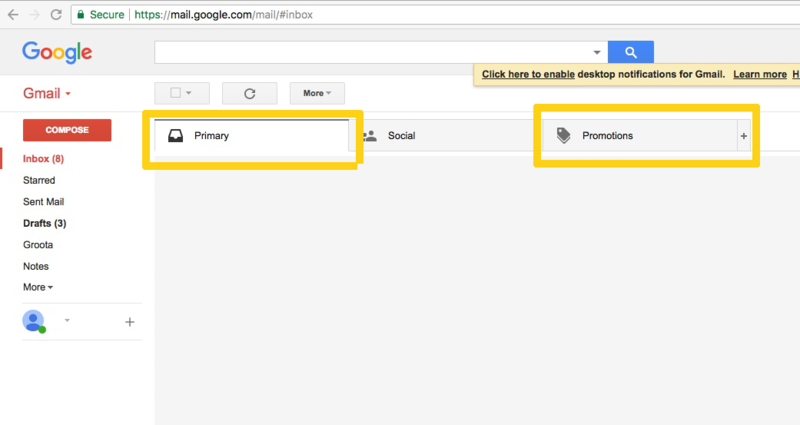 What happened to my promotional emails in Gmail after you process them? We will mark them as read, and move them to a folder called "Groota". Can I follow and un-follow a brand from my Gmail? Yes! Anytime with one click. When you un-follow a brand from your inbox, we just hide them from Groota feeds. Emails of that brand are not deleted and we don't unsubscribe for you. To find all your emails processed by Groota, go to "Groota" folder under your Gmail. Can I link multiple Gmail accounts? We do not provide the feature to link multiple Gmail accounts at this point.